You heard it here first: an exciting new Brahms project, slated for completion this summer, to be published by CIC. For over a hundred years, Brahms's final opus, the beautiful Eleven Chorale Preludes for Organ (Op. 122), has inspired both admiration and curiosity. 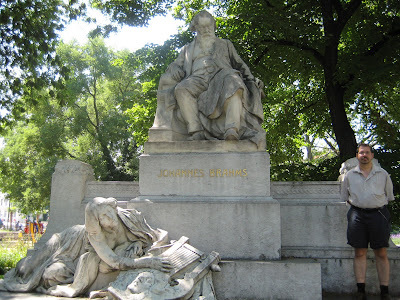 George Bozarth, Barbara Owen, and other musicologists have opined that Brahms actually intended Fourteen Chorale Preludes, divided into two groups of seven. The order of the first seven in Brahms's manuscript is 1, 5, 2, 6, 7, 3, 4. Clearly, the current No. 11 would be No. 14. That leaves Nos. 8, 9, and 10. What would comprise the missing three? The splendid Prelude and Fugue on O Traurigkeit (WoO 7) spring to mind. But that still gives us only 13. Rumor has it that Brahms sketched a few measures of a canonic treatment of Es ist ein Ros' entsprungen. We know that several of Op. 122 are revisions of earlier works. We know also that Brahms and Joachim liked to write canons, during the great days when Schumann was still among the living. This exciting publication will be available on or before September 1st. LEONARDO CIAMPA is an organist, pianist, composer, author, and vocal coach/accompanist and is highly thought of in each of those areas. Ciampa's compositions (which have been called “Neoromantic”) include orchestral, choral, chamber, and solo compositions. As an organ recitalist, Ciampa has made numerous tours of Italy, Austria, and Germany. Currently he is Artistic Director of the MIT Chapel Organ Concerts and Music Director of Christ Lutheran Church in Natick, MA. As a piano recitalist, Ciampa is known for his warm sound and colorful style reminiscent of the Golden Age of Pianists (pre-World War I). He is especially noted for his interpretations of Chopin, whose 200th birthday he commemorated with a series of six recitals in Boston (fall, 2010). Mr. Ciampa's compositions are published exclusively by CIC (http://cicmusica.com).